The New England Patriots have won their third Super Bowl in four years and now they are the NFL's newest dynasty! 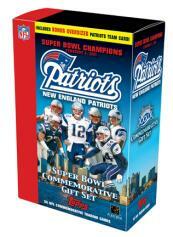 Topps is pleased to announce its Super Bowl XXXIX Champions Set commemorating the New England Patriots' historic win. The set is available now at www.topps.com and will be available at hobby stores and retail chains nationwide in just a few weeks.